What am I like!! I'm having a Vicky moment, as in 'Yeah, but-I'll keep it, No, but- it can be donated back to the charity shop'. I had to go and get Robert some new trainers for school, so of course I detoured via the charity shop to see if I could thrift a black leather jacket. Well, I do tend to find most things at the Salvation Army and this was for sale at £3.49!! To be honest, I was more impressed by the price-less than Vogue or Elle or a Big Mac meal even! So the pros-its in good clean condition, it is a perfect fit, its fairly thick for Autumn-not too flimsy, it was only £3.49. The cons-It's the same style as my brown one I found last month; the leather has a matt finish-Chris has cleaned it with leather cleaner, which has made it better than what it was, but its not shiny; its not a wow jacket-I don't really know if I want a wow jacket or not though! I shall keep it for the time being-it wasn't a waste of money as I've paid £3.49 to a charity. Keep it - it's a good basic which will stay around for years, and since it was so cheap you can still keep looking for the shiny wow jacket of your dreams without guilt! PS. I've just discovered your blog and I love it. I've linked to you! Chris is so handy and useful on the polishing front - good man! I think it looks a good fit and simple - simple in a clean classic way, easy to wear. oh but black and brown are different.... and such a bargain. What an amazing price for a leather jacket. I think you have to write a "Sharon Rose-guide-to-thrift-store-shopping-in-London". I like it! I think you should keep it. and you know my thoughts already! Heck, for something so inexpensive keep it, wear it, rock it! I'm glad you finally found that black leather jacket, its understated but edgy and would go well with anything! I like! Especially for the price. Hun, keep it. A girl can never have too many leather jackets. They instantly give you street cred wherever you go and that one is cool. This is a great find: a lovely simple silhouette that can go with anything. Hi Skye-thanks for your lovely comment-you've a great blog, I've linked you too!! Hi Kate-thanks a lot, your last sentence is what I was thinking too. Hi deb-good advice, thanks my dear!! Hi savvy-too true, thanks a lot! Hi vain and vapid-haha, thanks so much, I think I'm just lucky to live on the outskirts of London, where thrifting opportunities are in abundance!! Hi miss thrifty-so kind, thank you! Hi sydney speel-yes, so lovely of you, thanks! Hi fashion frenzy-thanks for stopping by! Hi eelie-thanks for your lovely comment, much appreciated! Hi wendyb-always so lovely, thanks a lot!! Hi lenya-so kind of you, thanks my dear! Hi jenny-you're welcome and thanks!! Hi anchibride-thanks for your lovely comment! Sharon I just got a jacket like that the other day from SJP Bitten line for $9 dollars I guess that would be 4 pounds in the U.K. You got yourself a steal!! Nice find and at the Salvation Army too!! hon what a fab bargain! the fits perfect,its on trend for autumn/winter. It is most definately a keeper honey! You will get lots of wear out of it and that price,its not a 'Yeah,but no..but yeah' moment. have a fab wknd with your lovely family. haha I love Vicky, and I have so many moments like that too! Thank you so much for your birthday post idea too! Hi budget chic-thanks for your lovely comment, I have added you to my list as well!! 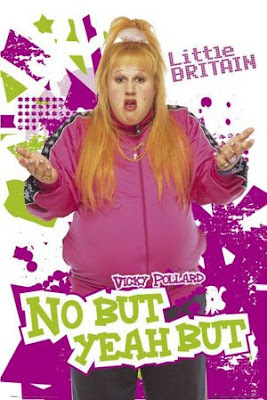 Hi marian-haha, I'm pleased a fellow Brit saw the funny side of Vicky too! Thanks for your lovely comment, much appreciated, I think I will keep it for the forseeable at least! Have a lovely weekend! Hi sunniva-thanks so much and have a wonderful weekend too! You are linked. Thank you for the love!! The clothes on your blog are just fierce!! I need everything! Hi budget chic-thanks so much, have a lovely weekend!! Oooh, I'll bet you find a use for it. Keep that baby around. I really like it, dearest. It is not supposed to be super shiny, right? And it is a perfect complement to that summer dress. Have a lovely weekend, dear Sharon! Great jacket Sharon - it's a very stylish and verstile piece so you should definitely keep it! Take care darling and have a wonderful weekend! 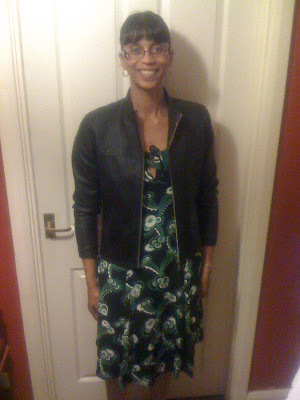 Hi fashion chalet-thanks for your lovely comment, this dress is Celia Birtwell for Topshop, she was Ossie Clarks wife!! Hi Sal-it had another polish this morning, so although still matt, its quite soft now-I think I will keep it, thanks my dear!! Hi fashion-obsessed-so lovely of you, thanks!! Hi Ida-yes, I think its meant to be matt, but its still a great jacket, its growing on me-thanks a lot! Hi Acielle-so kind of you, thanks and have a good weekend! Hi Danz-sorry to hear your charity shops are not up to standard ;-( Thanks for your lovely comment and have a great weekend my dear!! Hi fashion chalet-you're most welcome and thanks a lot!! Perfect!! Exactely what I want myself, so let me know if you want to sell it!! Have a wonderful weekend you too!! Hi Silje-always so lovely!! I have decided to keep it, as it is a good fit and simple style for me, I'm sure I will wear it in Autumn! If I change my mind, I would certainly let you know! Have a great weekend, dear Silje!! aw..its adorable. I came by something similar to that..free..my girlfriend's older sister didn't want hers anymore. So she gave it to me. But its not as nice as that one. I say keep it, a leather jacket that cheap! To be honest it's 3.49 isn't it? Barely anything! I'd keep it since it wasn't that expensive. It might come in handy. Hi ellie-thanks so much, I'm sure yours is just as nice!! Hi bhh, winnie and wendy-girls, you are all right-it is worth keeping it, I've been polishing it more to soften it up, so I'm liking it more now, thanks! !